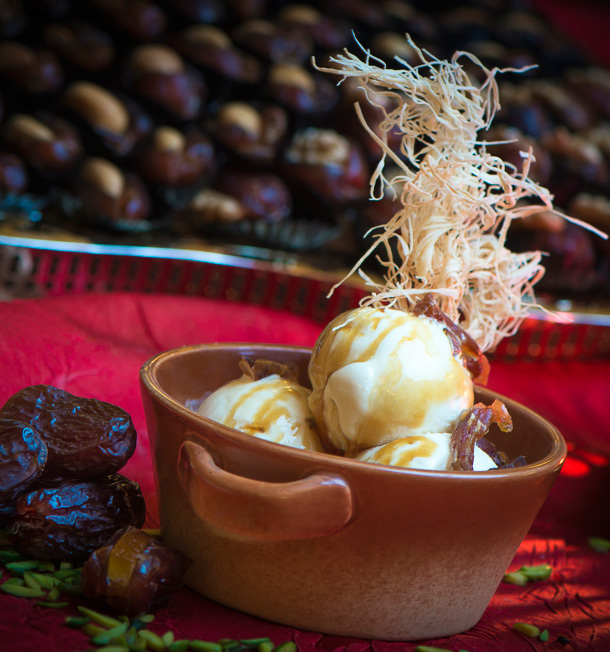 Dates hold a very special position in Middle East cuisine. This special recipe has been shared by Chef Ali El Bourji, the Executive Oriental Chef of Asateer. • Fill up the containers and cool down to -18° Celsius as soon as possible, to prevent crystallization. The date palm trees lining the streets of Dubai during the summer times are filled with dates – the colour of the dates reflecting whether the dates are ready to be plucked or not. Some of the date bunches are covered with nets (below) – these dates are the ones which are not ready to be plucked. Plucking these ones could be legally offensive. Just before the school term finished, picking up Big Z from her school and walking down to the car park – had been a big task. Not only had the temperature been hovering around 45 degrees but also the branches of the date palm trees had started stooping down – perfect for Big Z to pluck some dates. Perhaps, snatching a few moments of child-hood innocence in this blingy artificial city of Dubai! Here’s a recap of another ‘date’ dessert that brings in a lot of nostalgia from my childhood – A Tale of 2 Cities & Naru/Coconut Jaggery Truffles | A Dubai Expat’s Summer Story! 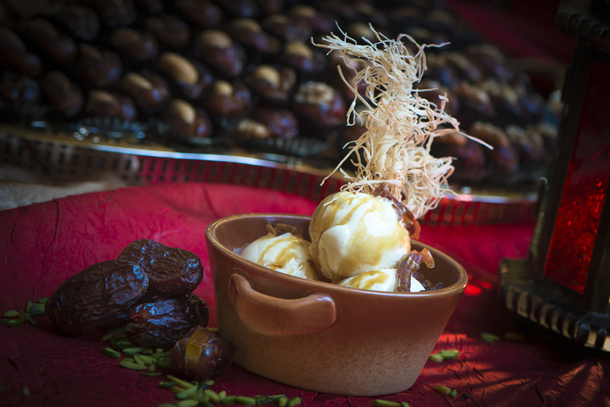 Dates have been a staple food of the Middle East and the Indus Valley for thousands of years. They are believed to have originated around Iraq, and have been cultivated since ancient times from Mesopotamia to prehistoric Egypt, possibly as early as 4000 BC. The Ancient Egyptians used the fruits to make date wine, and ate them at harvest. There is archaeological evidence of date cultivation in eastern Arabia in 6000 BC. (Alvarez-Mon 2006). There is also archeological evidence of date cultivation in Mehrgarh around 7000 BC, a Neolithic civilization in India now western Pakistan. Evidence of cultivation is continually found throughout later civilizations in the Indus Valley, including the Harappan period 2600 to 1900 BC. Asateer in Atlantis, The Palm: I did have a preview of this stunning tent (above). It felt like a page out of the ‘Arabian Nights’ with unique concepts like the Tahina Fountain a la the Fondue (first pic on the left), live cooking stations offering traditional dishes like Ouzi, a lamb and rice dish infused with Arabic spices – one of my favourite Middle Eastern dishes and presented beautifully (top left); Kebbeh bil Laban; Fish Sayadiyha; Halloumi and other Cheeses; the Katyaef (an Arab dessert commonly served during the month of Ramadan, a puff pastry filled with delicious Akkawi cheese); the Assafiri, a sweet crepe filled with an Arabic cream called Kashta and more. My pick? Ouzi and the Ramadan special juices like Jallab and Karkadeh or the sweet Hibiscus tea. The newly created Atlantis Foodie page has many pictures on the beautiful tent and gives more on the behind-the-scenes activities and other offerings at the resort. Traditionally, Ramadan tents are erected during the month of Ramadan, where people can meet right after Maghrib or the sunset so that everyone who’s fasting for Ramadan can break their daily fast with friends and family over an Iftar meal. Dates form an important part of Iftar (three dates are eaten to break the fast, in the tradition of the prophet Mohammed, who broke his fast in this manner). In Dubai, Iftar buffets are organised in many hotels around the city, complete with air-conditioned Ramadan Tents. I have been curious whether the grandeur of these Iftar Buffets contradict some of the very principles of Ramadan, which is abstinence and self-discipline. While some of my Muslim friends do not attain these Buffets because the prayer facilities for Maghrib isn’t there, most of these Ramadan tents nowadays have prayer rooms. As food blogger and artisan chef Dima Sharif explains, ‘While in Dubai, and especially among the expat community, Iftar Buffets are very popular – probably because they are away from family, and in Ramadan tradition has it that you break fast with a large number of people – it is not the actual tradition of Ramadan among most and not in fact the most famous forms of breaking fast. Actually, the tradition and spirit of Ramadan (the essence) is very much alive, and that is my focus this year. Do join me as I post special recipes from the various signature restaurants in Dubai – each hotel I have contacted have been really gracious and have handed over their special recipe. I hope you try out these recipes (assuming that a restaurant recipe is not difficult to cook! ), send me pictures and do keep connected over Twitter, Facebook, Pinterest and Instagram. Enjoy your summers and yes, do show off an ASATEER recipe to your guests. Happy Cooking! Disclaimer: Only the Chicken Kasba image has been provide by Asateer, the rest of the pictures have been clicked by me. The opinions stated here are my own and are independent. I hope you enjoy reading the posts with lot of visuals. Please do not use any material from this post. You can see more pictures of my travel and food journey here.